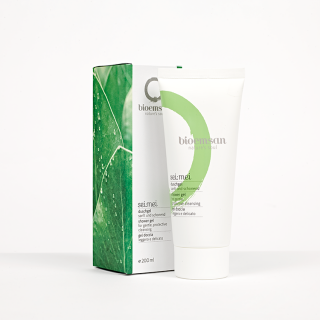 A feeling of freshness and balance - bioemsan body care gives the body a consistent supply of moisture, and gives connective tissue new vitality. Skin functions are improved by highly efficient Effective Microorganisms (EM). Luxurious organic ingredients make daily body care a pleasurable experience. 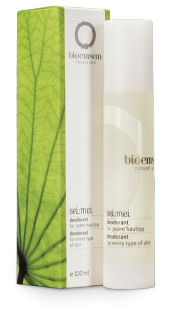 bioemsan shower gel for soft and gentle cleansing. Moisturising shower gel provides exceptionally gentle cleansing and cares for the skin when showering. Apply to the skin while showering and rinse off with clean water. Also suitable for washing the hair. Mild vegetable detergent substances gently clean; Aloe Vera Gel moisturizes, cares for jojoba and gold of pleasure oil and protects against drying out; herbal extract from lime blossom has a balancing effect on the acid mantle. Pure essential citrus oils make daily showering a pleasure. Leaves the skin feeling pleasantly dry and fresh. The formula contains valuable EM raw materials and sage extract from controlled organic farming to provide effective protection. Apply the deodorant to clean skin. Using directly after shaving should be avoided as the shaving can irritate the acid mantle. Can also be sprayed on tired and heavy legs to rejuvenate them. The natural alternative to conventional anti-perspirants: herbal extracts, Manju, Manju Sea Salt, essential oils and sage distillate keep unpleasant odours under control. Organic essential rose oil from damask roses provides a delicate fragrance and optimum harmonisation of sensitive and dry skin. Shower and body cream in one. 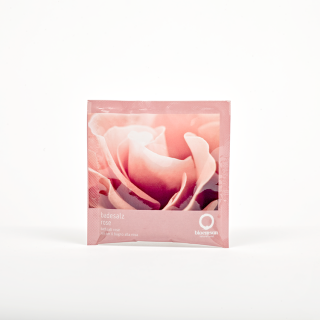 Mild, gentle ingredients with the fragrance of Damask rose. 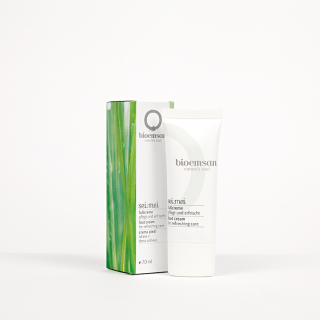 Valuable plant oils care for the skin while showering, leaving it soft and supple - with no need to rub in the cream. The formula contains beneficial marigold to reduce feelings of tension. 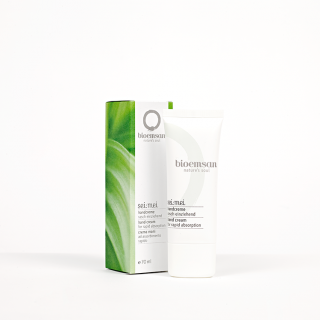 Provides optimum care, protection and lasting moisturising of the skin. After showering, gently massage into the skin and leave to soak in. Can also be used as a light facial cream in summer. Aloe vera gel and fragrant distillate of orange blossom and rosemary moisturise the skin, gentle cold-pressed oils provide suppleness; herbal extracts fermented with Effective Microorganisms care for the skin, replenishing the natural acid mantle; ceramic powder, Manju and Manju Sea Salt also use the unique EM technology and complement the high-quality formula. Organic shea butter and valuable oils protect the skin from drying out and make it tender and supple. Apply to clean skin and massage in the melted butter. Do not leave in strong sunlight or the stick will melt. Removes rough skin on elbows and feet. Helps with skin irritation and stretch marks and also protects sensitive children's or babies' skin. Shea butter and cocoa butter from Africa (a fair trade project by women in Burkina Faso) and fragrant coconut oil are the main ingredients; vanilla, hibiscus seeds, camomile and cedar provide an exceptionally subtle fragrance. Shea butter contains valuable valuable ingredients such as allantoin, flavonoids, phytosterols, micro-nutrients, flavourings and vitamins. Flavonoids promote regeneration of skin cells; Vitamin E protects against free radicals, which are responsible for premature cell aging; Vitamin A revitalises callused skin, while phytosterols promote blood circulation. bioemsan body butter is available with different fragrances to soothe the skin and increase its resistance. Rich bioemsan rose body butter cares for and soothes the skin. Valuable wild rose oils, shea butter and cocoa butter harmonise and nourish. bioemsan lavender body butter cares for and soothes the skin. Essential lavender oil soothes and pampers the senses with its gentle fragrance. Beeswax cares for and protects, sunflower and gold of pleasure oil soothe dry hands and edelweiss acts as natural light protection. 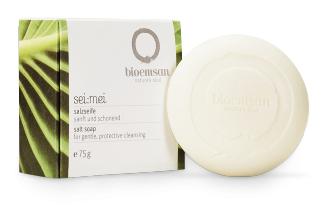 First wash the hands with bioemsan salt soap, then apply the cream liberally to the hands for protection against premature skin aging. Rapid absorption mean it is also "suitable for work". Thistle oil, jojoba oil and shea butter nourish the skin, orange flower water, rose flower water and witch hazel distillate moisturise the skin; herbal extracts, Manju, Manju Sea Salt and ceramic powder rejuvenate the skin's acid mantle. The rich formula of bioemsan foot cream contains valuable herbal extracts including horse chestnut, vine leaves and horsetail from controlled organic farming provides gentle care for overworked feet. Generously rub in for a cooling and revitalising effect. 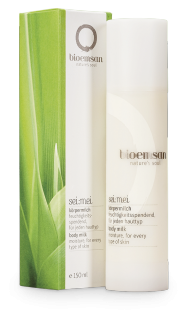 In hot weather, spray the feet with bioemsan facial tonic first. sunflower oil, castor oil, St. John's wort oil and shea butter. Ceramic powder, Manju, Manju sea salt and herbal extracts from red vine leaves, horse chestnut and horsetail promote a healthy foot climate and stimulate blood circulation. Distillate of peppermint, sage and witch hazel refresh and stimulate the skin. Natural, gently foaming relief for body and senses. Simply lather up and rinse with clean water, also suitable for facial cleansing. Valuable cold-pressed organic oils such as milk thistle an castor oil, organic plant fats such as shea butter, cocoa butter and coconut oil give the skin exceptional suppleness; Manju Sea Salt and ceramic powder moisturise the skin; natural salt binds the moisture in the skin thus increasing resilience; gentle cleansing and care with moisturising oils. 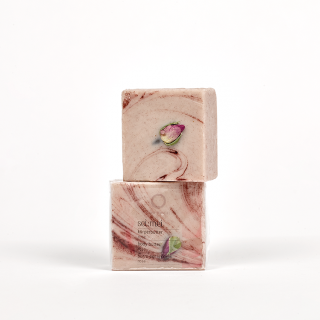 bioemsan rose salt soap prevents the skin drying out and has a moisturising effect thanks to lubricating oils. The elegant and gently fragranced soap is suitable for mild cleansing of the body, face and hands. The rose fragrance caresses the senses, while precious organic milk thistle and castor oils and shea butter care for the skin. Treat dry skin with bioemsan shower and bath salts, available with rose and lavender fragrance, to leave it feeling soft and supple. Gently rub the skin with a small amount, then rinse with warm water and dry carefully. The combination of natural rock salt - fermented with EM - high-quality plant oils, ceramic powder and carefully chosen fragrances is a feast for the skin and the senses. 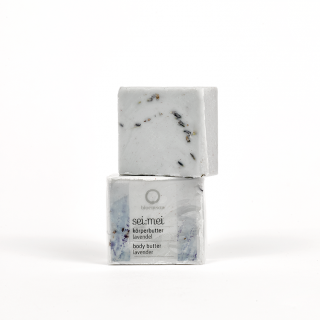 High-quality Manju Sea Salt ensures very gentle cleansing and care, even for sensitive skin. Natural salt is able to bind moisture in the skin and thus increases the skin’s natural resilience. The soothing and harmonising effect on the whole system brings a beneficial feeling of relaxation. Gently rub the skin with a small quantity of salt/oil mixture then rinse off with warm water and carefully dry. Add a small quantity of the salt/oil mixture to a foot bath, fill with warm water and enjoy a relaxing foot bath. After rubbing the body with a sufficient quantity of the salt/oil mixture, wrap the body in a sheet, cover warmly to build up heat. Leave for half an hour. Then shower and dry the skin carefully. For treatment of skin with cellulite; support in slimming cures. 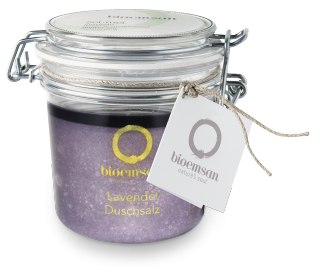 The bioemsan bath salts provide exquisite care in the bathtub through exquisite ingredients. Add approx. 1 tbsp bioemsan bath salt to the tub and let hot water run in. 1 sachet (30 g) is sufficient for two full baths. The combination of natural rock salt - fermented with EM - and carefully chosen fragrances is a feast for the skin and the senses. High-quality Manju Sea Salt ensures very gentle cleansing and care, even for sensitive skin. Natural salt is able to bind moisture in the skin and thus increases the skin’s natural resilience. The soothing and harmonising effect on the whole system brings a beneficial feeling of relaxation. Thanks to its exquisite ingredients, bioemsan bath salt is wonderful when used in the bath tub. Add approx. 1 tablespoon of bioemsan bath salt to the tub and fill up with hot water. 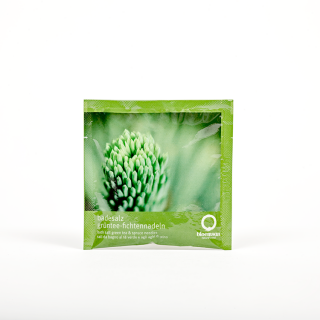 1 sachet (50 g) is enough for 2 full baths. Removes excess skin cells, promotes circulation, regenerates cells and strengthens connective tissue. Mix the bath salt with a small amount of oil and rub into the body with circular motions. Shower with lukewarm water and carefully pat dry. Removes excess skin particles, promotes blood circulation and cell renewal and strengthens connective tissue. Mix the bath salt with some oil and rub the body with circular movements. Rinse with lukewarm water and gently pat dry. Pour a small amount of the salt and oil mixture into a foot tub, let warm water run in and enjoy a relaxing foot bath. After rubbing the body with a sufficient amount of the salt-oil mixture, wrap it in a linen towel, cover it warmly so that heat accumulates. Rest for half an hour. Afterwards shower and dry the skin carefully. For the treatment of the skin with cellulite; support with slimming cures.